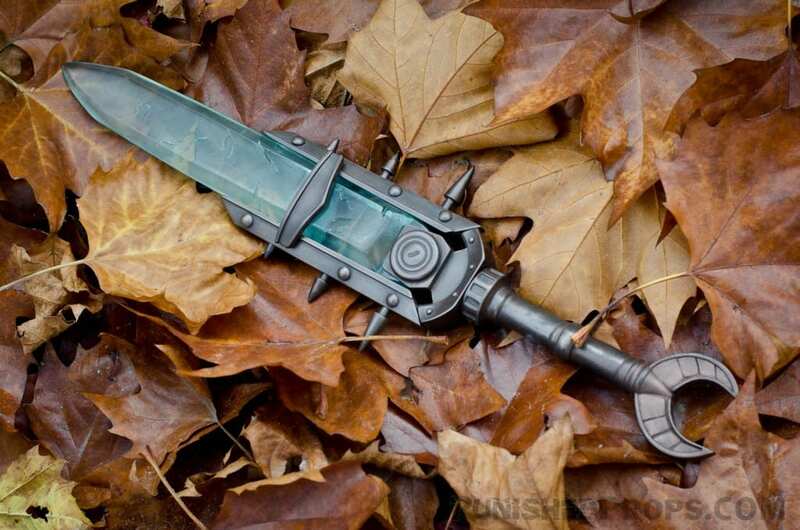 I finally got a replica prop commission to build this amazing piece from Skyrim! In order to get good reference images of Keening, I decided the best thing to do was to play Skyrim and acquire the in-game item. 10 hours of gameplay later (I got a little sidetracked) and voila! I had the dagger! I grabbed some snapshots of the screen and drew up my own schematics. I started out by turning the handle on my lathe out of a cylinder of polyurethane resin that was cast in a toilet paper tube. The side spike things were also lathed from plastic. The bottom wing-a-ling pieces of the pommel were shaped out with foam PVC and styrene, then filled in and sculpted with Apoxie Sculpt. The rectangular holes at the top of the handle were cut from a strip of styrene, which was heated and bent around the handle. 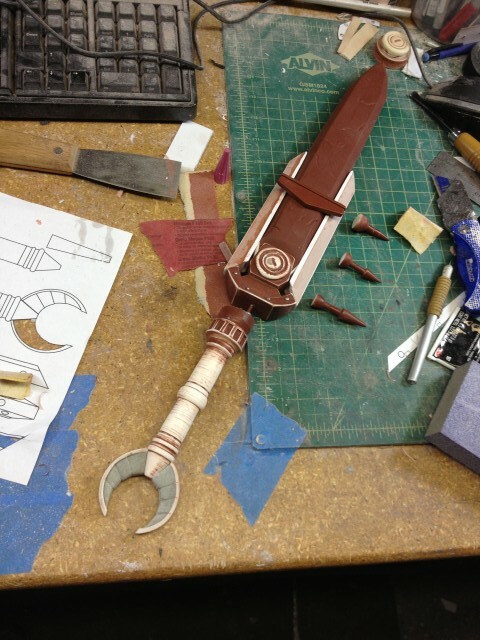 The hilt pieces and the crystal were both made from 3/8″ thick foam PVC sheet. 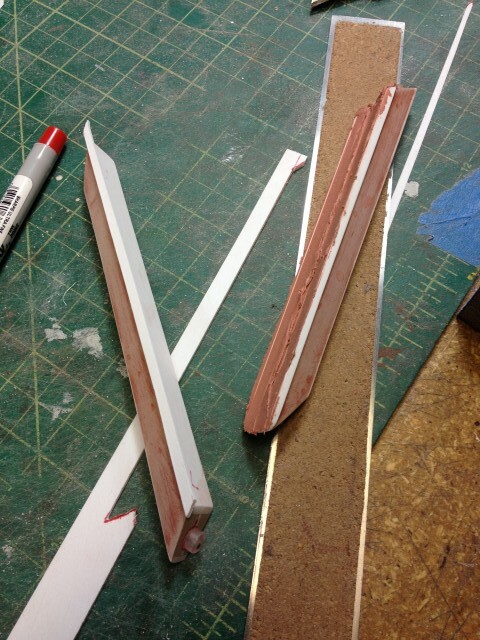 The “skeleton” shape pieces were cut from thin styrene and glued to the PVC. The empty spaces of the skeletons were filled in with Bondo and shaped on a belt sander/Dremel. 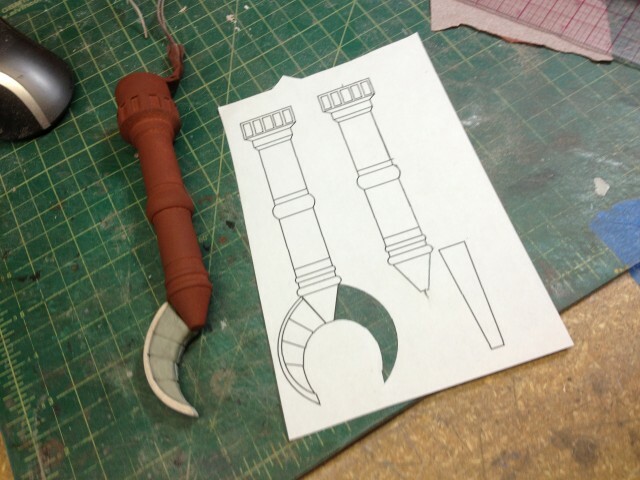 Also the circular piece on the hilt was lathed from plastic and copied in a clay push mold. 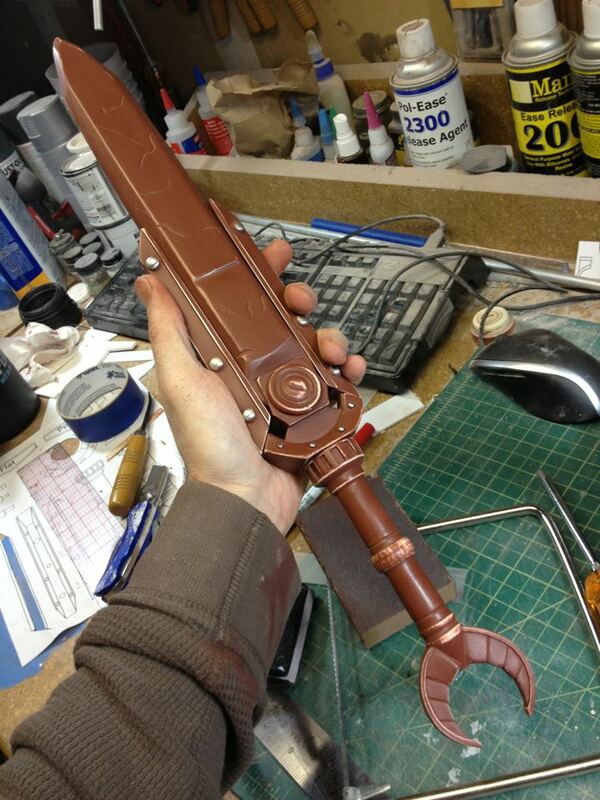 The metal detail pieces on the hilt are the heads of rivets that were cut down and glued in place. 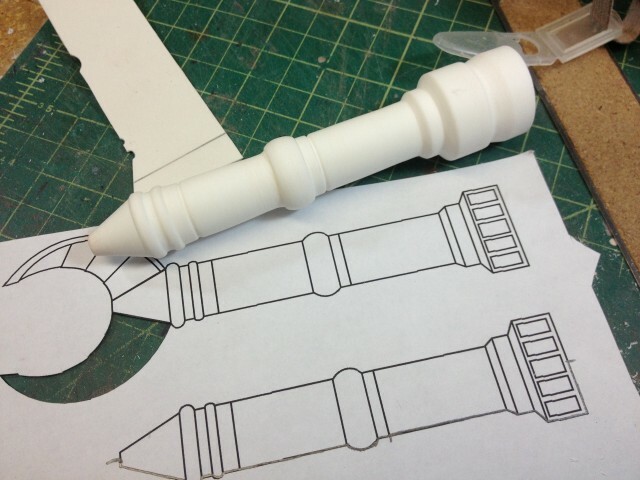 The sides of the hilt were done similarly, but from just the thin styrene. 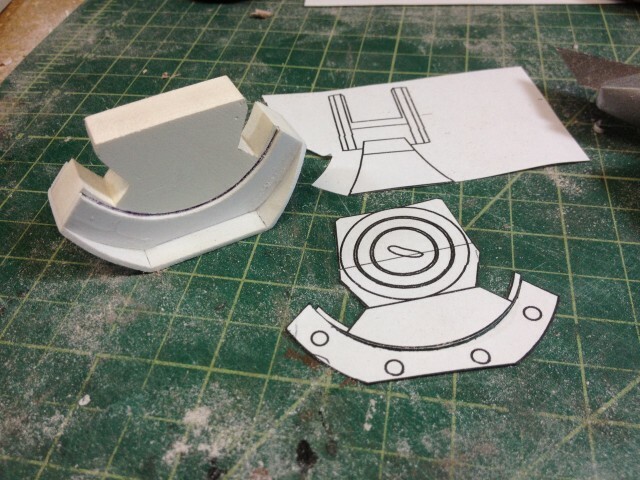 More detail bits were added to the side pieces with styrene. 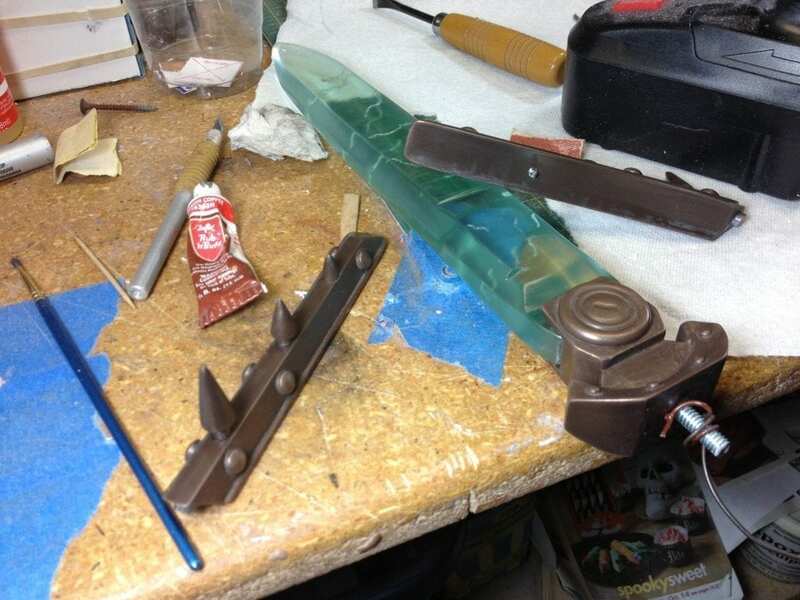 I also drilled holes into the side pieces to accept the side spike things (not pictured). 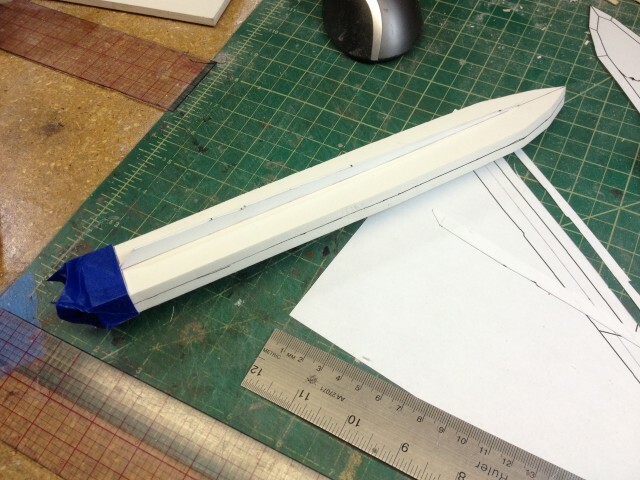 The cross piece that bridges the two side hilt pieces was made from a flat piece of PVC sheet and styrene. 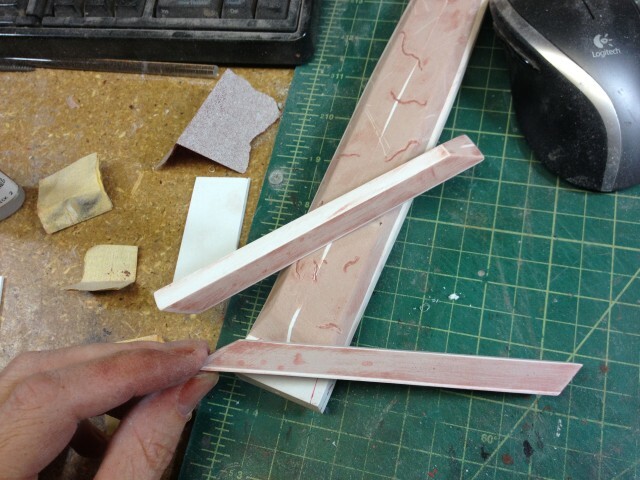 The plan is to cast it flat and then bend it around the crystal while the resin is still pliable. 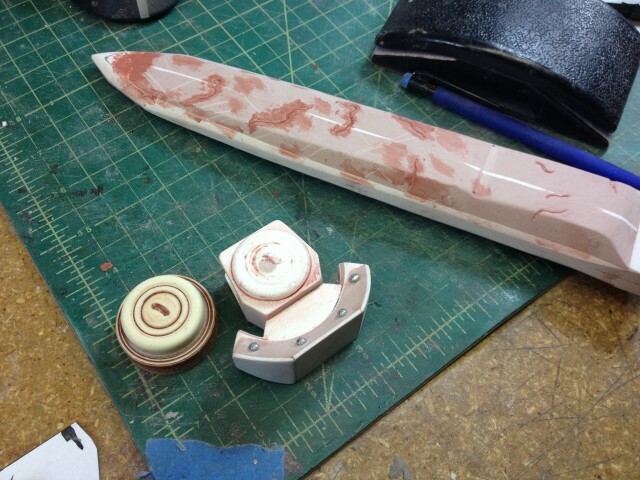 The metal detail bits on the side hilt pieces are furniture tacks that I sanded down to size and glued down. 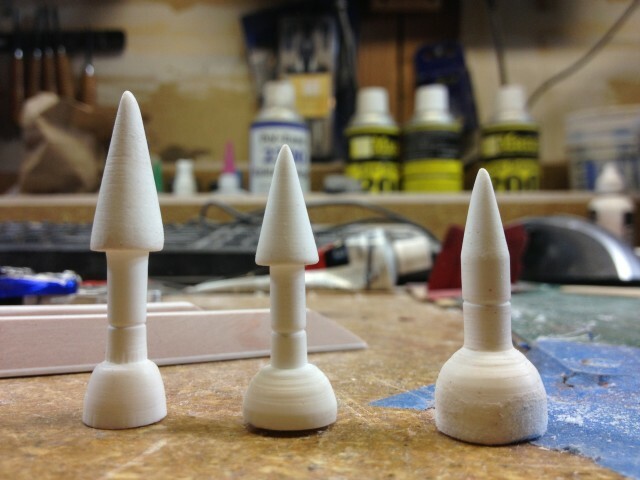 With all of the pieces done, I put them in clay for molding! Cut to two days later and the silicone molds are done! 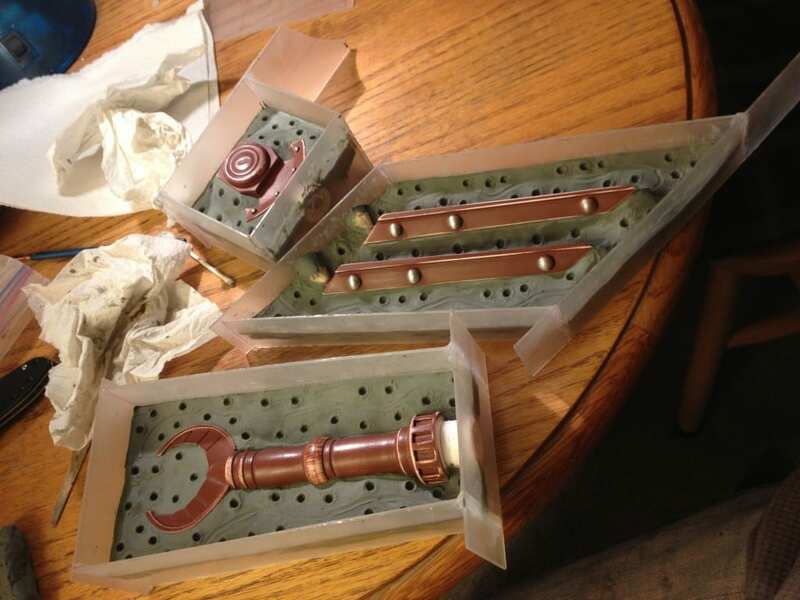 The plan is to cold cast the pieces in plastic resin with bronze powder. Here are a couple of cold cast pieces, one that has been buffed with 00 steel wool and one that has not. 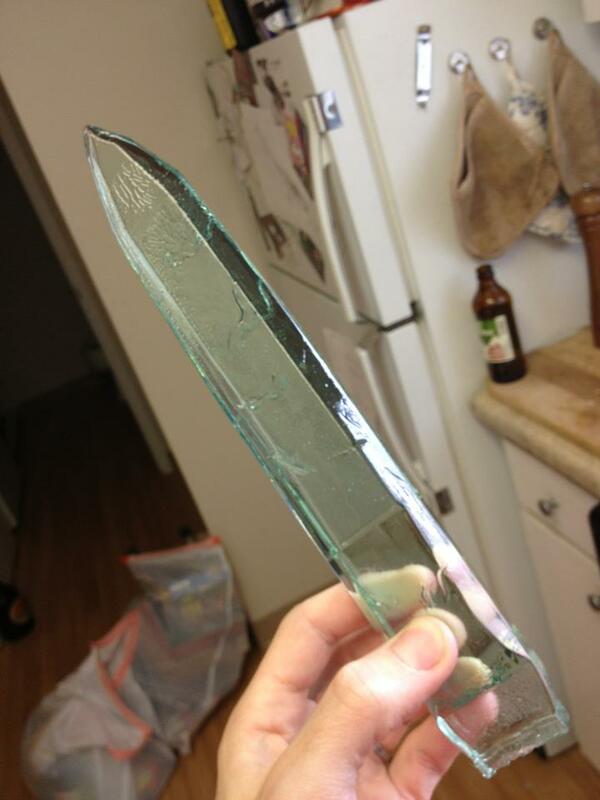 The crystal was cast from Tap Plastic’s Clear-Lite polyester resin with some green and blue transparent tint added. It took nearly 2 days to fully cure, and the outer layer remained rather tacky and hard to sand, but once I got through, that it buffed up quite nicely. 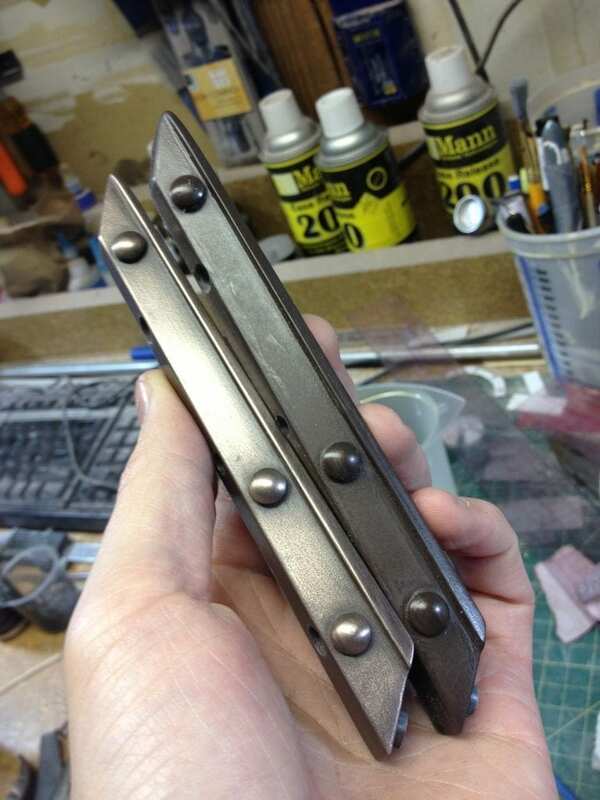 If I were re-making this piece now, I would use a less toxic material, like Smooth-Cast 325 resin. When working in a home environment, stay away from polyester resin. 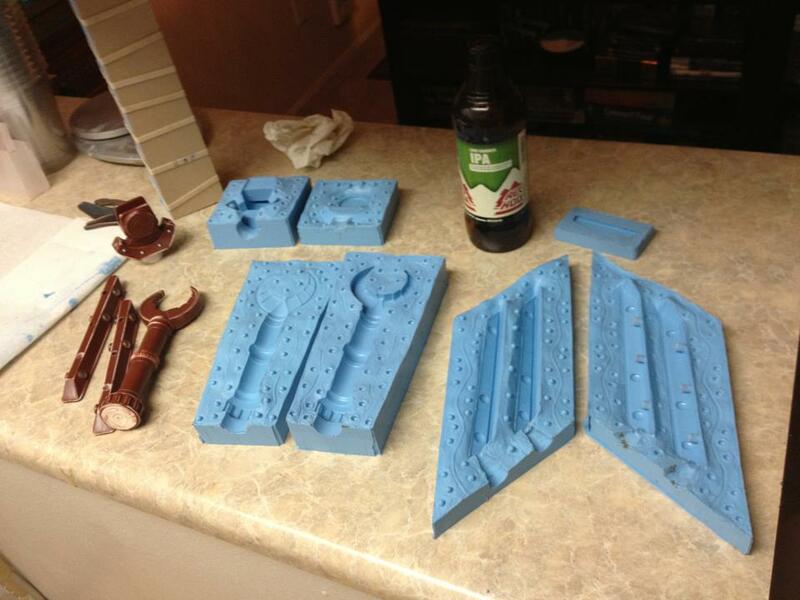 With all of the pieces cast and buffed, it was time for assembly! Some screws were added to add support to where the side pieces attach to the crystal. Those screws will be obscured by the cross piece. 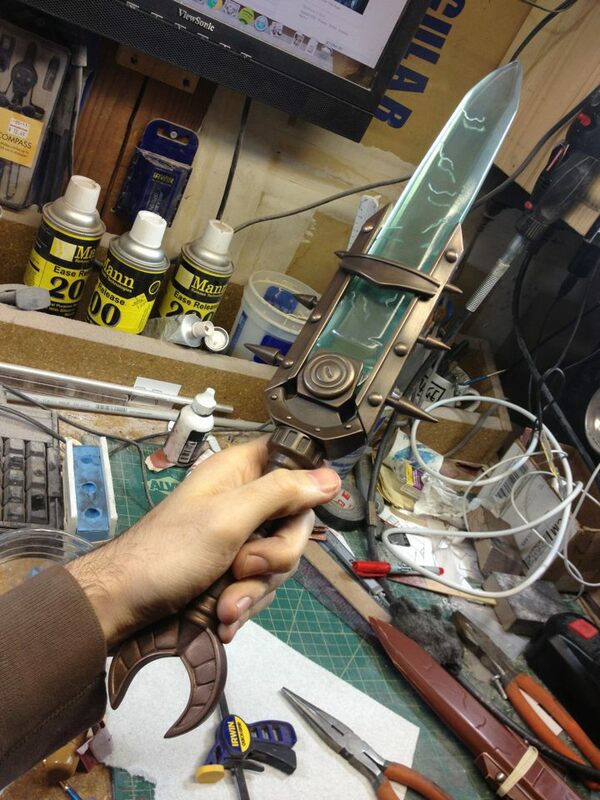 I also put a 1/4″ threaded rod through the hilt that goes all the way from the handle piece to the crystal.